Finally i started the making of the mitical incense: while collecting the several raw materials, i had the chance to evaluate’s their scent. I report in this post my olfactive descriptions. 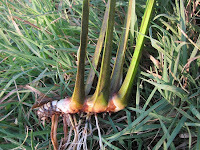 A river plant of which was used the dried root (ryzome) : its scent is very particular, sweet, of raw skin, greasy, lightly milky. 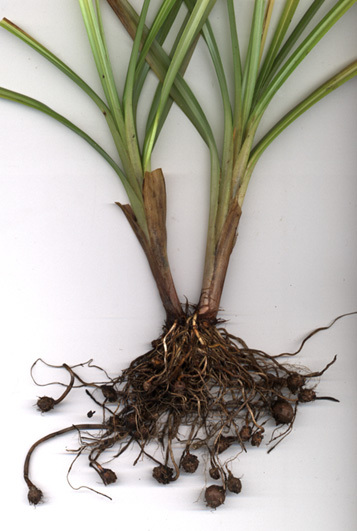 Anothe river plant: the dried root has an iris-like scent, earthy, dry, delicate, powdery. a) wood, b) root, c) castoreo. So I need to obtain a scented material with an woody-earthy smell with some leather/resin notes. 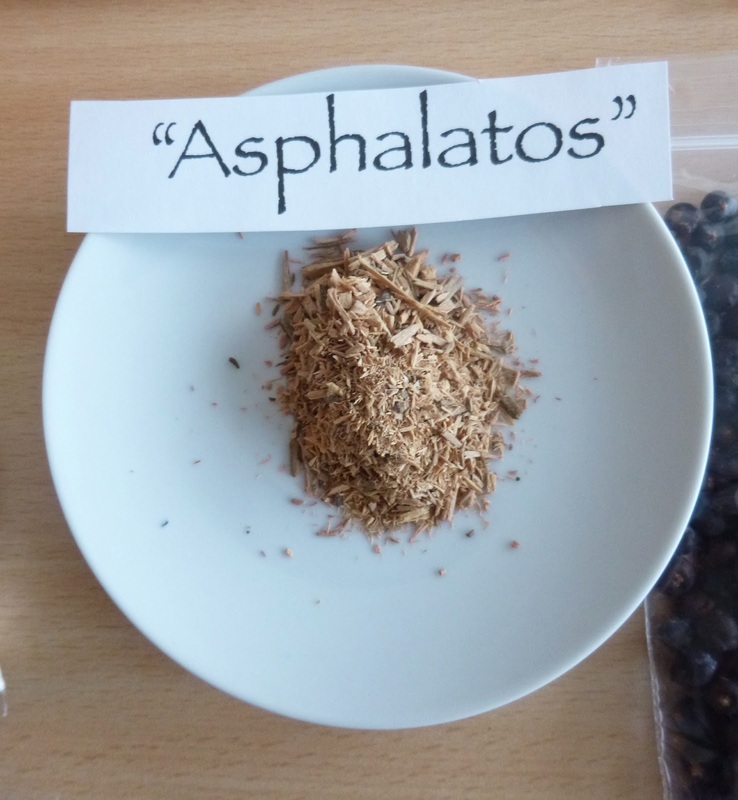 After several trials, the scent of the final mix i choose have an earthy decisa tonalita molto piacevole with woody-resinous note in the backgroud, very original: I choose this mix as material resembling my Kiphy’s “Asphalatos”. Even if was not used the resin but the dried plant and seeds, we can reasonably think that the scent of this material was very close to the resin itself: a strong scent, pungent, green, herbaceous, not too much tolerable smelled in purity. the kiphy version i choose to make (first Edfu’s recipe) expect the use of Storax. Storax balsam is obtained by incision of the liquidambar tree’s bark. Its scent is no-doubt balsamic, very diffusive. 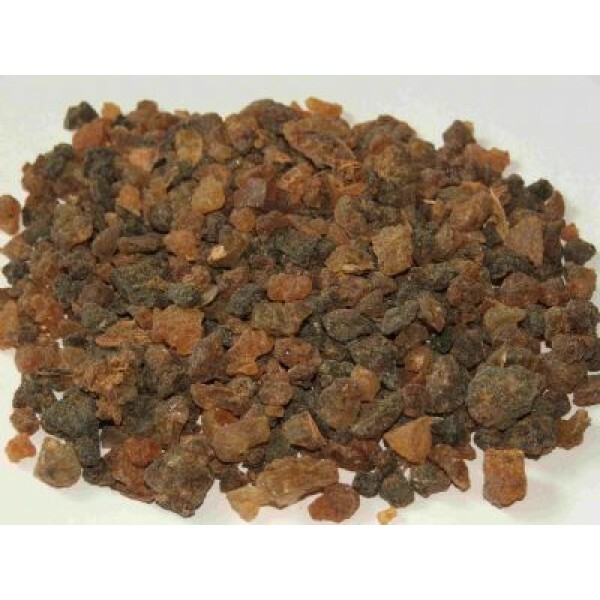 the mastic that comes from Chios island was known since antiquity for its disinfectant and asettic properties. 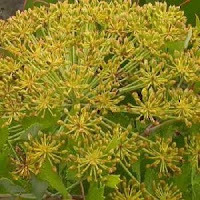 was used as the forst chewing gum for purifing breath. 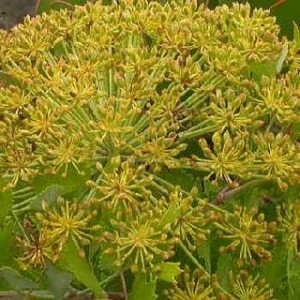 Has a slight green, pleasant aromatic and warm scent. the scent is intense, cold, hit the nasal nostrils. it is so powerful that it is possible to smell it even if close into a sealed plastic bag. 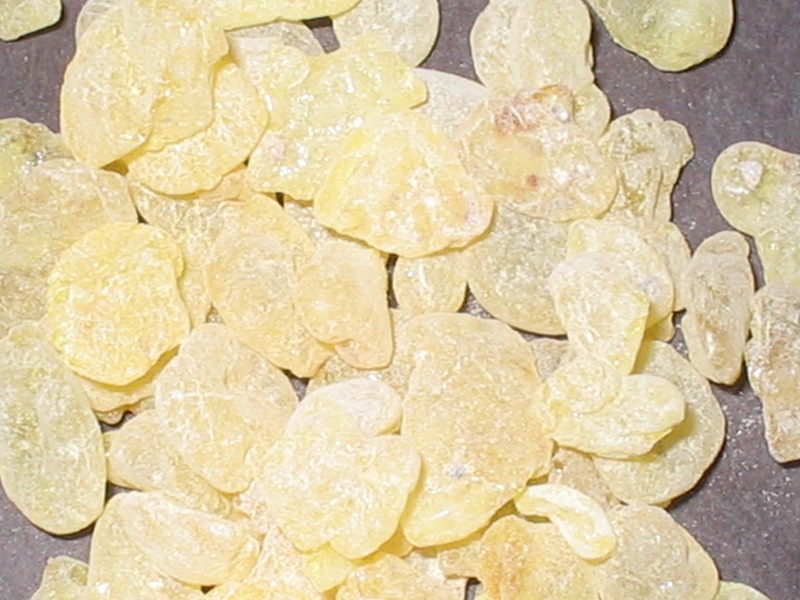 i found on the market the powder of arabic gum, it has a slight milky scent, almost non existent. 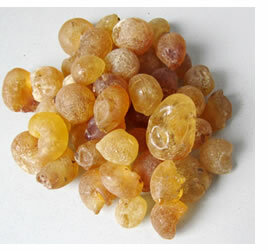 Frankincense (Boswellia carteri)The resin from the several Boswellia trees is probably the oldest mistical material in religious use with marked fresh-citrus scent and unique aromatic quality. Together with Frankincense, it is the mistic resin par excellence. 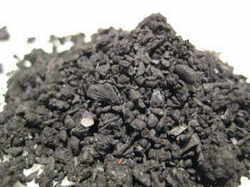 characteristic odor as aromatic liquorice, balsamic, dense, waxy, warm. 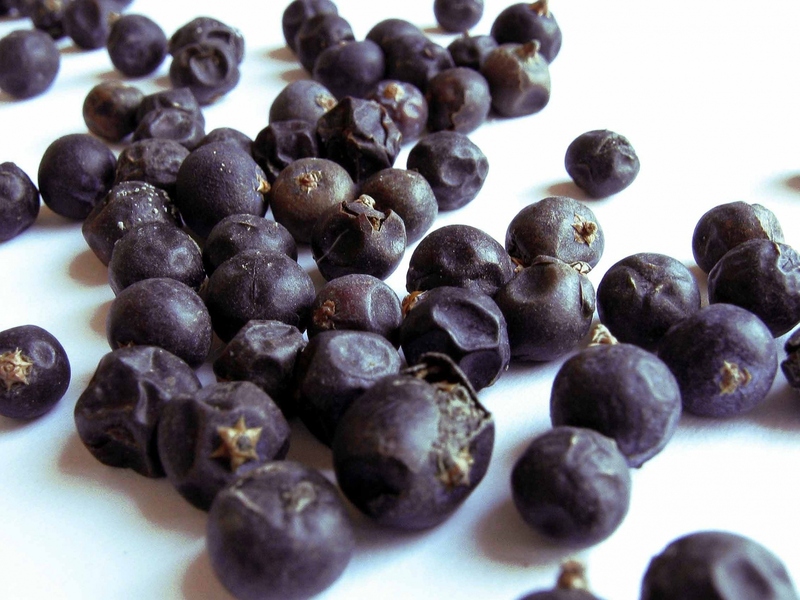 Juniper berries are used in Gin production: the grinded and macerated berries’ alcoholic extract is used to give the unmistakable aroma to the famous distillate. So, here the berries grinded in the mortar give a green, herbaceous fresh scent, slighty canforaceous; after a while come out a metallic note. We can only make hypotesys on the organoleptic quality of old egiptian wines. 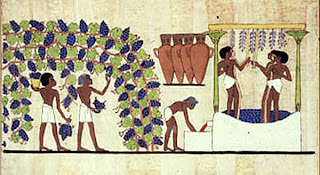 what the Egyptians intended as wine for sure would’nt encounter our taste. the grapes wort fermentation was not controlled as today and the resulting fermeted liquid probably had the taste that make it undrinkable; it is known that usually these “wines” were added with honey and resins just to make them more tasty and to let them last. So i think that the scent of this kind of wines could be more like a todays common table wine, a bit aromatic and acid: as a wine that is just on the way to become vinegar. in ancient times, every drinkable liquid made from any sugary content material was named wine; certantly the ancients understand that some fruits that were not keep good, develop a “differenet taste and maybe they develope a technique to obtain the alcoholic liquid. Desert oasis are often cultivation places for dates , a food that was important in all middle east population diet. A date wine was certantly produced in old egypt and often called “the sweet eye of Horus”. I choose for my Kiphy to make a “date wine” by maceratig the dried fruits in an slighty alcoholic acqueos solution (7%). after a week, filtered away the solid residue i obtain a liquid with an aromatic sweet scent. 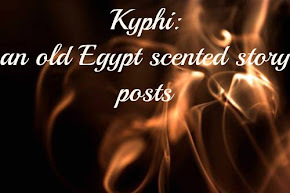 In Edfu were found 2 recipes for Kiphy: the first was taken as the “traditional” recipe, the second as the “revised” recipe. 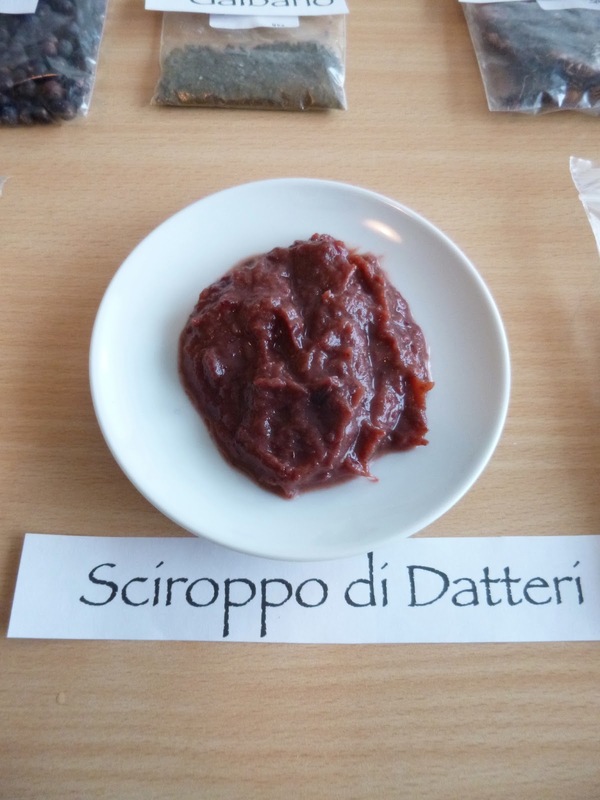 For this ingredient, the first recipe call for date syrup, while for the second recipe was honey. The date syrup is a macerated dough of the dried fruits in water that is boiled gently til the achievement of a dark brown paste with a fruity agreable scent. Old egyptians use to eat fresh and dried grapes, mostly the upper class. The raisins was used too for medicine and cosmetic recipes. Their scent is sweet, caramel like, slighly mouldy. ...With this raw materials i am going to prepare Kiphy. 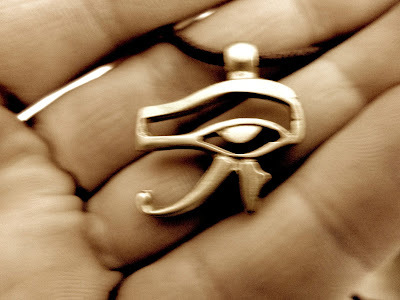 "........Let Horus Eye guide my hands....."